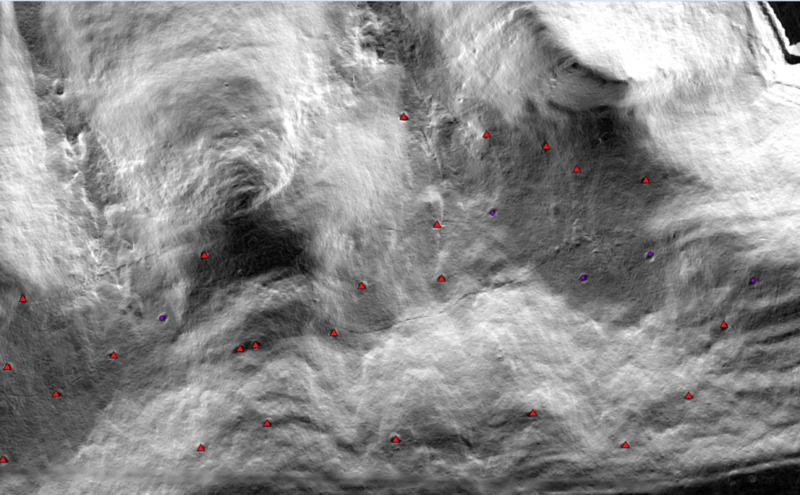 Finding Charcoal- LasTools + PASDA LiDAR data= Amazing! Posted on October 14, 2016 Author Ben Carter	2 Comments on Finding Charcoal- LasTools + PASDA LiDAR data= Amazing! For a long time, I have been interested in charcoal production on the mountains around the Lehigh Valley, which I first learned about along the Lehigh Gap Nature Center‘s Charcoal Trail. I had hiked this trail many times before I discovered what the name meant. Along the trail are flat areas (around 30 feet [10 meters] in diameter) upon which colliers (charcoal makers) piled large mounds of wood that they charred to produce charcoal. One of the primary uses of that charcoal was iron production. Indeed, the area around the Lehigh Gap Nature Center (ok, a bit farther west) was owned by the Balliet family who owned and operated two iron furnaces, one on each side of the Blue (Kittatiny) Mountain (one in Lehigh Furnace, Washington Township and another in East Penn Township; and likely a forge in East Penn). I became interested, but was not truly fascinated until I found and perused PASDA’s Imagery Navigator. Within the Navigator, you can view DEMs (digital elevation models) created from a LiDAR survey from around 10 years ago. To put it too simply, to collect LiDAR a plane flies over an area shooting the ground with lasers. Since the location of the plane is known (through an amazing combination of GPS and IMU) and the speed of light is known, lasers bouncing back to the plane effectively measure the distance to a “return”, which is an object, such as the tree canopy, a trunk, a roof, or the ground. 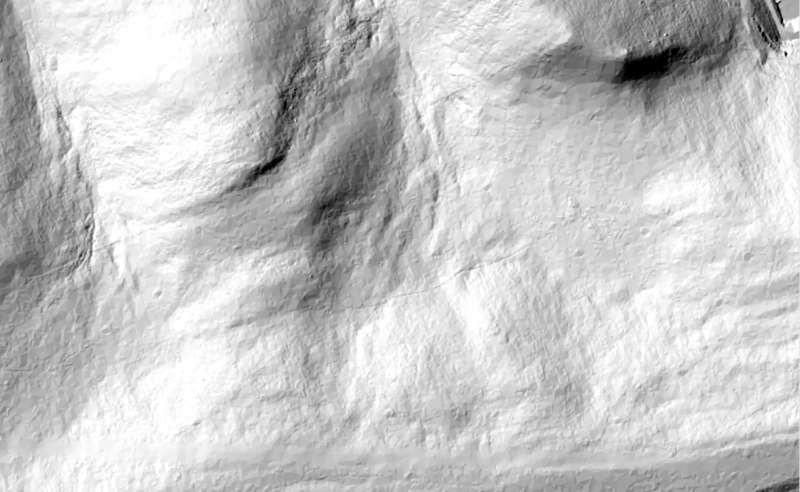 A DEM is then constructed from the LiDAR point cloud. I wondered if this data could show me flat areas on the sloped landscape (like those clearly visible along the LGNC’s Charcoal Trail). They could! I used the “hillshade,” which is a view of the landscape created by applying a light source to the DEM (digital elevation model). It’s as if all of the vegetation was removed from the landscape and it was painted gray with a sun shining on it from the NW at about 45 degrees. This way, I was able to identify over 400 charcoal pits over an area of approximately 100 square kilometers. .
So… many years later, I am finally doing something with this. My students and I, as a part of a Field Archaeology class, are investigating charcoal pits and the people who used them. More on this part of the project another time. In the meantime, my GIS skills have dramatically increased and I was lucky enough to attend a workshop on LiDAR (funded by NSF and run by NEON and Open Topography; a special thanks to Kathy Harring, Muhlenberg’s Interim Provost). I was interested in LiDAR for a new project that I am working on, but as a part of the workshop, we were to do a small “project” based upon new understandings and skills developed over the three days. I choose to download some of the original LiDAR data (props to Pennsylvania for providing all of this online) and build my own digital elevation model. The idea was that I could tweak it in order to see the landscape better. So, I started off just trying to remake the DEM provided via PASDA; that would at least show that I had developed some skills. However, just trying to do this resulted in spectacular results that have changed the way I conceptualize the landscape and our project. Most importantly, the resolution of my reconstructed DEM is much, much greater than that of the DEM provided by PASDA. It is clear why this is true (see this description), but it is not apparent as it should be when viewing (or downloading) the PASDA DEM. PASDA provides a DEM based upon points that are categorized as “8,” which are “Model Key (thinned-out ground points used to generate digital elevation models and contours)”, not those categorized as “2,” which are “ground” points. So, I was working with all of the ground points and the PASDA provided DEMs were based solely upon a subsample. 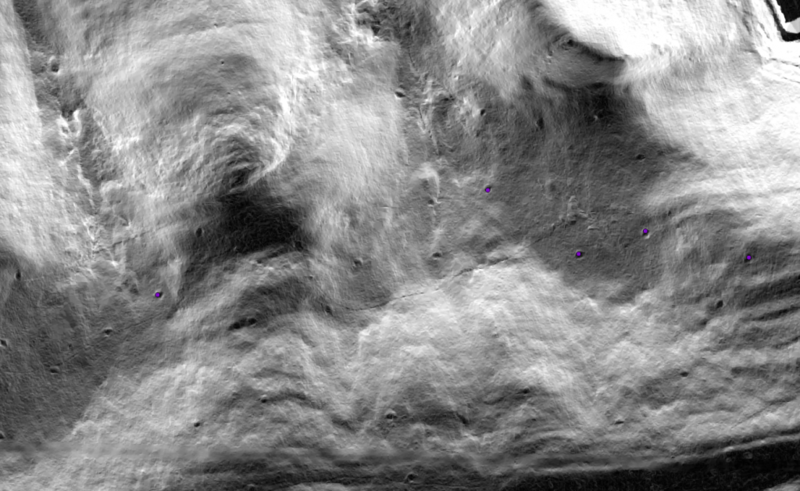 Here’s an image of one section of the area under study. This is original data from PASDA. Note the “eye-shaped” flat spots. In the following image, I have marked all of the charcoal pits I could find with a blue dot. 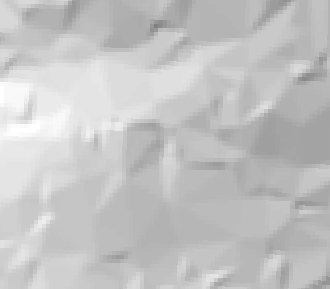 This image shows the hillshade made from the DEM I built. Honestly, it doesn’t look terribly different from far above. Perhaps a bit more granular. 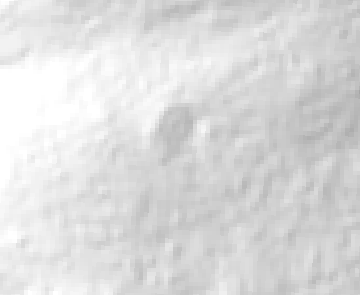 However, once I do a slope analysis, which shows flatter areas in darker gray and steeper areas in lighter gray, the charcoal pits (which are flat areas on a sloped landscape) literally leap out of the image. The image below shows all of the all of the newly identified charcoal pits with red triangles. 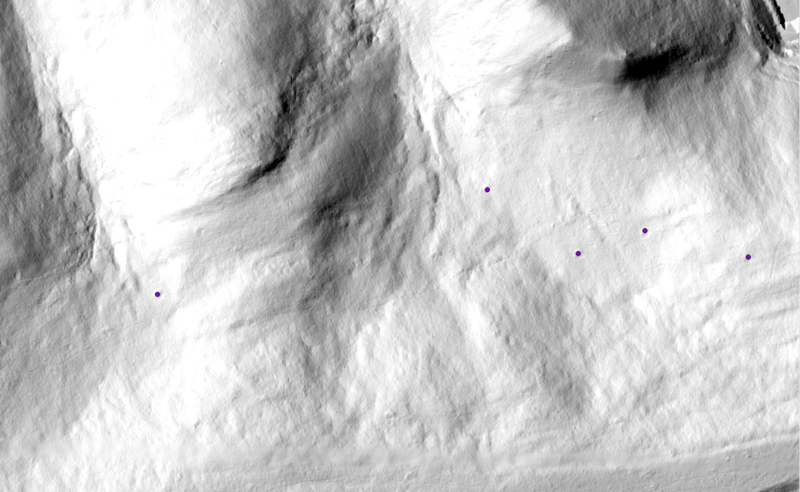 A landscape that I once thought had minimal charcoal pits (I wondered why… and was developing possible hypotheses) now appears to have been quite densely packed with charcoal pits. Next post… details on exactly how I did the above. Hint- LasTools and QGIS. Previous Previous: Wanna collect data digitally? Fascinating – delighted to discover your work. Iron’s role in Pa’s earliest colonial history, i.e., local manufacture of fasteners, implements, and weapons, vital to sustainable “inland” homesteads/settlements, can be a story better told by the landscape, e.g., your work, rather than detail in a random history text. Have you given thought to cross-referencing evidence your work generates with known, indicated, or suspected, ironworks’ related landscape disturbances, e.t., ore pits, furnace sites, roadbeds, quarries (think furnace, damn, and mill construction), as well as other forest dependent industry, e.g., tanneries, sawmills, local specialization i.e., the Conestoga Wagon, etc. all for associated tree species, and “invited” in many instances by colliering’s initial entry to Pa’s forested uplands? Thanks much for the comment! It sounds like you are as interested in (maybe obsessed with!) landscapes as I am. Yes, we are trying to do exactly what you are asking about. In fact, my students and I just presented our work at the new National Museum of Industrial History in Bethlehem. It attempts (we are only in the early stages) to address the complex interrelationships between iron ore mines, charcoal pits, furnaces (and forges too), the people who owned and worked these landscapes and the roads, etc. that connected all of these components. So far, we have really only confirmed that these are in fact charcoal pits. We had hoped to find a colliers hut, but the one we thought we had discovered (a semi-subterranean pit) turned out to be just another charcoal pit (though an odd one). We have not yet addressed sawmills, etc. though we will need to take them into account AND, perhaps at a later date figure out the more complex relationships, for example, were the woodcutters for the charcoal also harvesting certain timber for sawmills? or was the wood destined for the charcoal pit first barked with the bark ending up in the tannery? You have clearly thought a great deal about this and based upon the terms, etc. that you are using clearly have some experience. I’d love to hear more. If you like, we can send you our report once it is complete (early next semester).